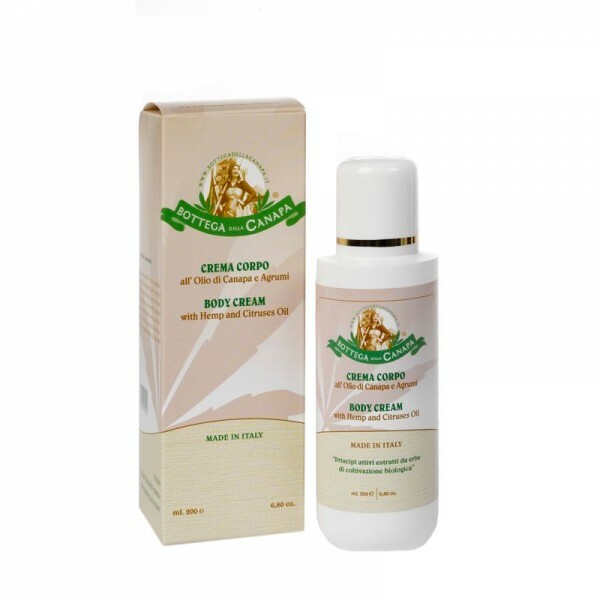 Very fine emulsion for the body with anti-aging action based on vegetable and essential oils. Fresh and light as silk, with a very pleasant aroma, ideal for those who love to get deeply hydrated. Package: 200ml. Very fine emulsion for the body with anti-aging action based on sunflower, jojoba, hemp and essential oils of lemon, orange and mandarin. Fresh and light as silk, with a very pleasant aroma, ideal for those who love to get deeply hydrated. It is a true aesthetic treatment not to lose tone. Each application will be a pleasant gesture to devote oneself to. Easy to spread, detoxifies and invigorates the skin of the whole body. Apply the cream with a gentle massage on the whole body. Used after the shower, it will take care of the skin quenching it, protecting it, restoring the right hydration and elasticity and giving it an intense and lively aroma. AQUA, OLEA EUROPAEA (fruit) OIL, PRUNUS AMYGDALUS DULCIS SEED OIL, CANNABIS SATIVA SEED OIL, GLYCERYL STEARATE, CETEARYL ALCOHOL, STEARIC ACID, SODIUM LAUROYL GLUTAMATE SIMMONDSIA CHINENSIS SEED OIL, BENZYL ALCOHOL, SALICYLIC ACID, GLYCERIN, SORBIC ACID, CITRUS LIMON (peel) OIL, CITRUS AURANTIUM DULCIS (peel) OIL, CITRUS NOBILIS (peel) OIL,CITRAL, LIMONENE.